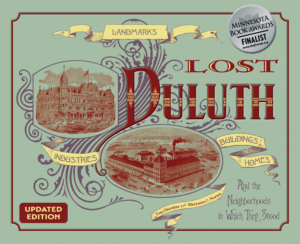 For years this building’s design was credited to Duluth architects Oliver Traphagen and Francis Fitzpatrick, but more recent research indicates that the architect was actually H. G. Linderman, who sold the blueprints to the U.S. Treasury Department for $1,100 in 1889. It’s possible that Traphagen and Fitzpatrick were credited with the design because its Romanesque Revival style was often employed in their designs and because Traphagen supervised the building’s construction. The Federal Building featured a square tower with turrets, arched second floor windows, and terra cotta trim on its windows and doors, all of which contributed to the heavy, massive feel of the building’s Romanesque style. On the second story of the western façade workers carved an eagle onto an eight-ton square piece of sandstone. 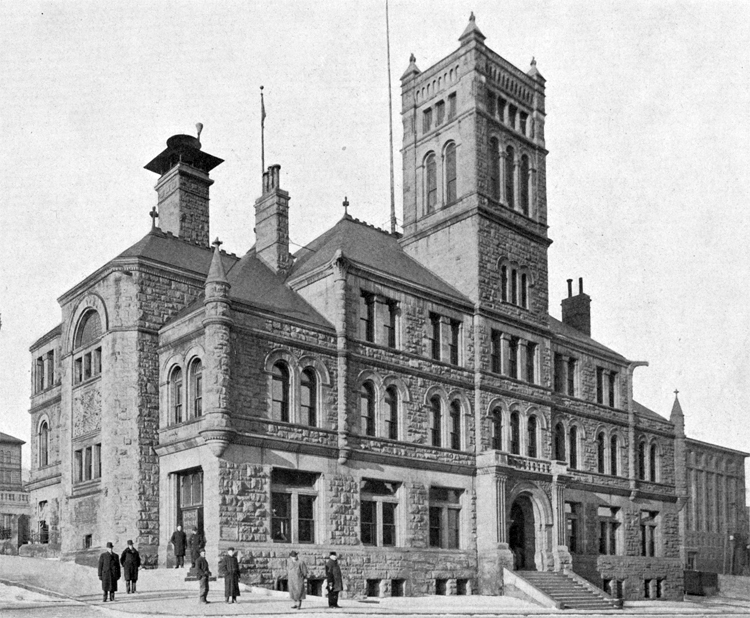 In 1930, construction completed on the new Federal Building anchoring the west end of Duluth’s Civic Center, and offices moved from the old federal building into the new. Soon Duluthians began calling the old landmark an “eyesore.” Demolition took nine months, from December of 1934 to August of 1935. Workers dismantling the building found a bottle within its walls; it contained a cloth written with the message “Goodbye, Friends.” It was dated November 11, 1892, and signed by “James Peterson, 14th Ave. E. and Charles Bowman, 465 23rd W.” Officials hoped to relocate the eagle carving to the Naval Reserve Station on Park Point, and it was safely removed from the second floor façade with a six-ton crane. Unfortunately, the Navy had to reject the offer because of the stone’s immense weight. After demolition, the site of the old Federal Building was seeded as a park. Since that time the area has developed into a circular driveway with parking serving today’s Federal Building, Court House, and City Hall. In its center stands fountains and statues, including the Soldiers & Sailors Monument designed by architect Cass Gilbert and sculptor Paul Bartlett.